Empower the future of vehicle electrification technology. Find solutions to enhance energy efficiency of smart grids, HEV/EV, e-mobility, and more. Sustainable energy technology is driving our future lifestyle, from vehicle electrification to home energy management systems. 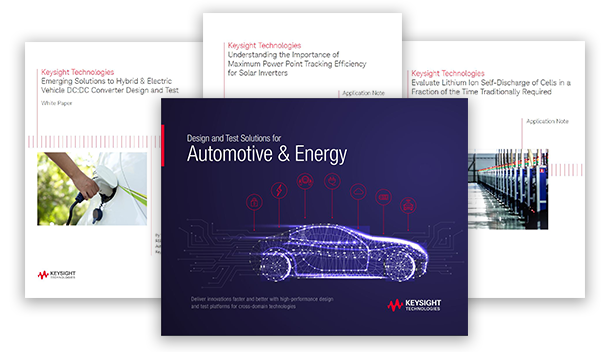 See how Keysight solutions can help with solar grid energy efficiency, emulate high-power, high-voltage electric vehicle battery testing, cell self-discharge characterization, and power device modeling. Download white papers and application notes on how to perform an ev test and how to test your battery system, battery self discharge and pv simulator. In order to best serve you, please choose your country or region below.